50p? Clifton Suspension Bridge was only 20p when I last used it. Looking at your Scotland route, seems we have Fort William and Pitlochry areas / roads in common between your journey and the one I'm making in a few weeks. Any info you wish to share (where not to eat, where to stop etc) is welcome. 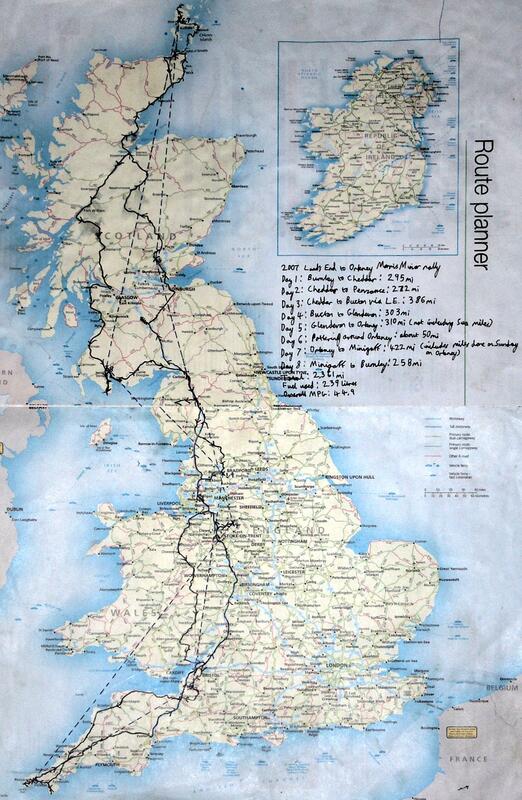 The grey blurs on the map, are they indicative of anything, or are they where you drew the route and rubbed it out? I can't decide if they are mountains or wallplanner-style smears! That would have been too sensible, plus I wouldn't have been able to say I'd driven over the Clifton Suspension Bridge. Ideally I would have liked a photo from the outside of me driving across it, but that would have meant handing my camera to a stranger and trying to retrieve it afterwards, so a couple of photos from inside the car was the next best thing. I didn't stop at Pitlochry or Fort William. On Saturday we met up at Perth and the first stop that day (half an hour at a petrol station for us all to fill up and use the toilets) was at Dalwhinnie. On Monday I had a few minutes for a photo stop at Loch Ness and another (at a rough guess) about 30 miles after I went through Fort William - both photos are in the report. I then broke down for a couple of minutes after Crianlarich, stopped for ten minutes at some kind of hydroelectric plant next to a lake to stretch my legs and clean the fuel pump points, stopped for another ten minutes to fill up with petrol at Girvan, and finally reached the YH at Minigaff at (IIRC) about 9PM. The grey blobs are the result of rain soaking the map and making the ink run. Ah, fair enough - I kinda assumed you'd told the potted highlights but I suppose if you were covering that kind of mileage you really didn't stop too often. Not to worry! Like the photos of the lot of you.